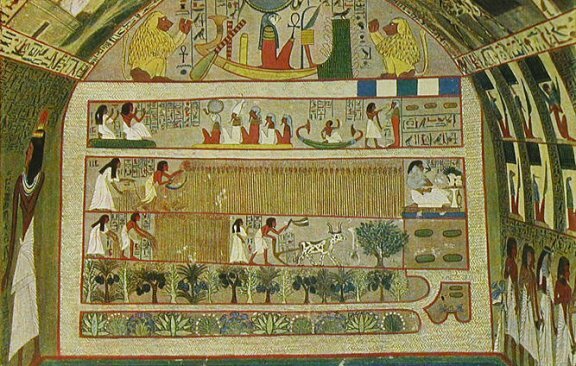 Der el Medineh - This is a complete picture of the Egyptian Elysian Fields, or Paradise. The whole region is seen surrounded by water with two principal streams dividing it. Above is a picture of the Sun-God, in his morning boat, adored by two apes. The God-falcon-headed, is crowned with the sun-disc, round which a snake is coiled: he holds an Ankh before him. The long island at the bottom is covered with flowering plants and shrubs of various kinds, so also is the next division at the broader island or tract of land. It is covered with fruit trees, among which date and Dom palms are conspicuous. Above the fruit trees, we see Sen-Nezem ploughing with two cows, one black, the other white, while his wife sows behind him; further, the pair are busy pulling up flax by the roots. Beyond is a large field of yellow grain, which Sen-Nezem is reaping with a flint-hook, with serrated teeth, taking the ears only. His wife gleaning behind him, puts the ears into a basket. At the right end of the field of standing grain, Sen-Nezem is seated before a table of food and drink, and he also inhales the fragrance of a lotus. Above the river of blue water of the Wheat and Barley Nome, there is another division of the Garden, where, to the left Sen-Nezem and his wife, kneeling on a heap of yellow grain, are adoring a group of five gods, all seated. At the further end of Ra-hotep the son of Sen-Nezem, paddling in a papyrus boat.